I really like the concept of blogging from Jill Walker Rettberg, a professor of digital culture at University of Bergen, which he referred to the research of Olga Dysthe, regarding how to use writing in learning. Blogging combines thinking writing skill and presentation writing skill with conversation added. I think I have experienced some of these skills before way back in my teenage years when I owned my online diary account. As I mentioned in my first blog (ever) that I used to spend time writing diary, I enjoyed it because it helped me to think what had happened that impressed or annoyed me back in the day. It literally help us to think. Later on, after I shifted my interest to online diary platform, I became developing my writing skill towards presentation writing. The style of writing we deeply aware that somebody might read our piece of work. It’s actually more fun for me to write, when I know there will be someone reading it. I found myself using more creativity in my writing hoping it wouldn’t confuse readers. So now that I’ve been attempted to write blogs for the past three weeks, I experience the identical skills and also some beneficial consequences. To me, blogging builds confidence on expressing my own opinions. I think it is a basic psychological distress for some people to worry about how others are going to feel about us when they read our work, especially in the academic topic sphere like “Marketing in the 21st century”. It really gave me a bit of anxiety at first because I don’t want people who disagree with me think that I am stupid. But by the time I started my third blog, I got more confident and seem to value more on my own views. Also, the comment and feedback I got were speechless. Even though some people think differently, they just argued politely and we built a good discussion later on. Moreover, I believe blogging helps me to spend more quality time with myself and lead me to actually learn more about myself (the things I thought I knew but I didn’t). I became more aware of my thoughts by seeing why I write in favour more on particular side or offend the opposite. Sometimes blogging even triggers me to think that something I’ve been believed in might not seem to be right anymore. And I say that is the point where I’ve learned to change my attitudes – blogging helps me growing up. What have you learn from blogging? Interesting perspective about the blog I learned from you. I admit that I also worried about how people feedback towards message in my blog. Ironically, not so much people the blog anyway. I doubt if my way of writing a blog really build my confidence. But for sure, it helps me to learn about new aspects of digital marketing since most of my blog posts are inspired by other blogs or discussion happened from our class. You mentioned once that you like to write, hope you will find some fun idea from this blogger. Also, if you keep on blogging. What would be your blogging style blog concept? Oh I just saw your additional comment here. I plan to continue on writing both marketing bits and life events. As Mike has help us to started this for our career, I think why not just try to keep up with it. Yessss, I totally agree with BlogBrighter and I also believe that the content will be attractive if it is related to the readers in one or many ways. Now talking about this bit reminds me of ‘storytelling’ issue we’ve learned from MOOCs, one thing that pop up in my mind when I finished that session was Swift’s songs. That’s how she incorporate story of herself in her pieces of work, in fact in her whole career. I think it’s such a brave and passionated way to do so. Nonetheless, come back to blogging, with the topic we were assigned to write is kind of framed us to write with limit and style. We cannot blend our stories with every topics, can we? Some topics are too broad and too ‘digitally’. But as i said, I’ve learned a lot and I’ve been enjoying it. I think when we submit all the assignment and I am free to write whatever I want I would be enjoying even more. Nice post, Faii. Actually, I truly saw the enormous improvement of writing skill and contents getting more and more critical compared to our first post. For me, I would rather spend some time to considering an interesting topic than spend a great deal of time to developing a dead content. It means that as a marketing blogger, it is important to do the marketing observation in advance to attract other classmates to view and leave a comment. But how do you overcome not much bias judgement but still criticism? Hi Winnie, thank you for your comment. I like your strategy of blogs observation in order to initiate a greater idea. However, being criticism is a main role for this assignment, isn’t it? Well, don’t judge me as a professional of this area, trust me I am still struggling to be critical every now and then. I think the best answer would be what Professor Wang said today, it really depends on situations or cases. I mean in order to think critically you need to have a base idea that support with proof. If you are just oppose the issue but no evidences or examples to debate with I think that is bias. Good point you have mentioned here. 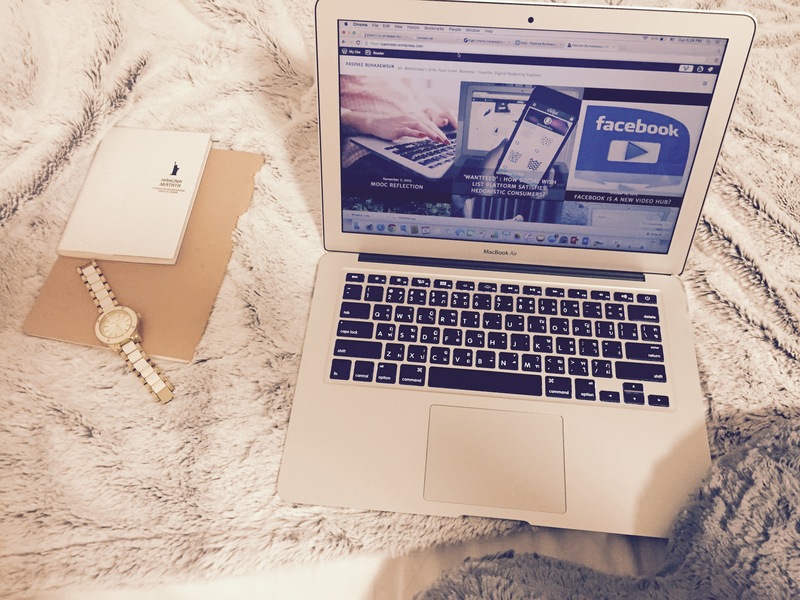 I never think to compare blogging as my diary before. However, i will use blog as a CV booster and only for business purpose. Anyway have to tell you that be careful of what you blog though, because people in this online world like to judge the book from its cover ! Nice post! I really like the way you explain your story and your feeling through blog towards every single letter. Well-organised writing pattern are made into your blog (as well as creativity idea) and you also have made a clear picture by illustrating story step-by-step. I feel I was throwing back to my childhood because when I was young, I used to have my own diary book and diary via online platform as well. One more thing, do you think blogging give us less privacy mode? I think it is similar with facebook, instagram or other online platforms that we should be aware and take it into consideration. I feel sometime lack of private zone when my blog is shared into public place where anyone could see,argue,debate and comments. I might be wrong because as you mentioned that a good discussion is the way to open our thoughts. Additionally,I do like blogging if I could really express and feeling or attitudes but sometimes if the educational contents are being involved like we were asked to do just now, I think it is quite a big problem for me to think about the interesting topic to attract readers. That is one reason I didn’t like blog. Anyway, I believe that blog gives me some positive things to me that’s why it is the assessments for our course work. Surely, blogging give you less privacy but I see that as one of its strengths. As I mentioned above, I enjoy it better when I know someone is going to read it. I guess it is the same feeling of proud or satisfied that the writers get when they see someone read their books, or when the singers hear that their fans can sing their song. I think we want to see people interested in our work because we want them to know that we can do it and hope they’ll like it. So with all these reasons, I think it is why we definitely have to be aware of what we write or deliver. People might get offended for some topics and I say it is normal to happen sometimes. But it is best not the put your privacy information up here. I think if you like the feeling of privacy, it may be better to write down as an 0ld-school diary. I really believe that it gives a different feeling to us. I still do honestly nowadays but I just keep it simple and short. I think it is fun to read back your old diaries. I really love when I have written into my favourite notebook diary and throwback my precious time by picking up and reread it. I recalled the memorable time I spent in many years ago, and of course it is very secret 🙂 somehow it requires consistency to work on. I remember when I was young I forgot to write my diary because of many reasons, too tired, nothing special to express my feelings on. Many days passed, I need to write back from the past until the present, sounds funny isn’t it? I think diary are needed to write every single day, but for blog is not. The one main different for these two methods are the feeling when I typing on keyboards and feeling when I pick up my favourite pencil or pen to write. It’s great that you had a good experienced on writing a diary which is completely different from me. I also had an experienced in writing a diary before but ended up within one week. For me, I could say that writing blog is really bored and tried but I still got some benefit from them. While blogging, I can get a better though which I have to think about topic for blogging. More knowledge while reading an interesting article. I can also practice my English skill in writing and reading. These are the benefits I got from blogging which I think it is very valuable for me in the future. Yes, I think most people (classmates) hated blogging at first because they never done it or try it before. And also I think because we know that this is an assignment so we’re struggle to make it looks good and hope to satisfy the lecturer, which in fact blogging is more fun and more free than that. Most people getting to like blog at the very end because they find their own way to adapt themselves with their own writing style. For me, Blog is always in my idea but I won’t do it because of privacy. I love to write since i was young. The reason that i love to write on diary is that I love the clover of book, sounds silly but true 😛 Anyway, after I was assigned, i don’t have much idea about blogging but now I’ve changed my mind to love blogging. It is true that blogging shows our possibility in many aspects such as writing skill, critical thinking but the most important thing for me is quality time with myself(as you mentioned). Blogging make me more curious and observant about what happened in everyday of my life. I use time to realize and writing the blog. It is not only you or me who just pass today but we are now learning what we have been through. So, now i don’t think that blogging is a big deal like before,but i will think that blogging is one of my friends who i can talk to about marketing or other topics that i want to tell.